Our lenses are covered for 12 months from your date of purchase against any breaks or cracks that are deemed caused by normal usage. This lens is for the Sinister goggle, NOT the Sinister X5 goggle! 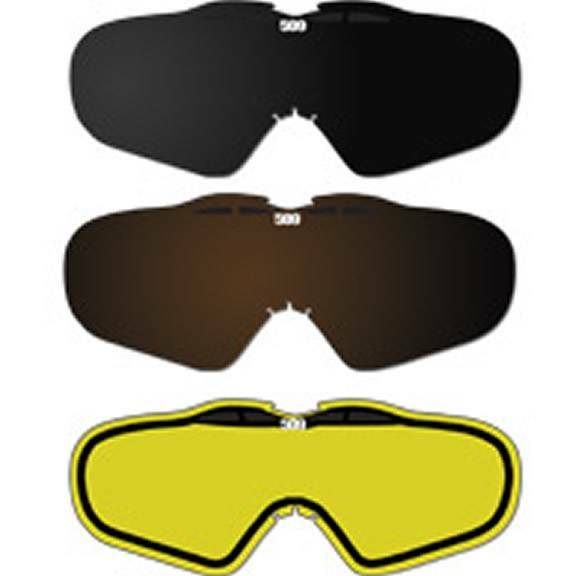 Our goggles use a dual lens designed specifically for cold weather & high moisture use. Featuring complete UV protection, dual lens panes, anti fog, anti scratch, and shatter proof. Our lenses come in a variety of colors however polarized is HIGHLY recommended. Each lens is uniquely designed with dual view technology. With our chrome lens for example, the user see's an orange tint which highlights definition in low light, yet from the outside the appearance is a high chrome finish. In addition the chrome finish not only provides a very nice 'look' but also has the functionality of reducing glare on bright sunny days. This dual view technology is a new feature we perfected & included on our goggles, so they not only look sharp when in action, but also have the unique functionality of two completely different views depending on if you are the one using the goggles or viewing them from the outside. This encompasses the best of both worlds by providing a functional lens that increases snow definition yet doesn't have the bland look of a standard orange tint lens!